1) You've been working part-time for the same company for the last year or so and you feel like you've hit your peak - there's no where else to go until you start full-time, and even then, it's not a guarantee. 2) You're working for a company and you disagree with the direction management has taken or will be taking. Something just doesn't sit well with you. 3) You have issues with your supervisor or colleague that you've addressed but seen little or no action taken. Any of them sound familiar, even vaguely so? If they do, and you've decided to resign, than this post is for you. 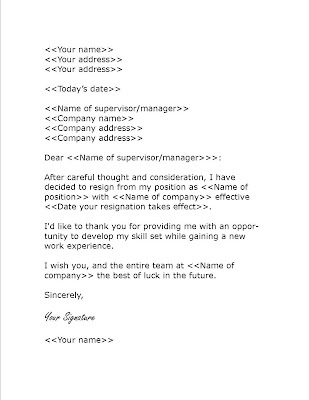 Resigning a job can be one of the toughest things you'll ever have to do. It's never easy to say "I quit!" Once you do, you can rarely, if ever, take it back. And people may begin to treat you differently once they know you are on the way out. So you're you might be thinking, "Well I want to leave my job, but is there a way to do it properly?" And the answer ... YES! Here are my top 5 tips that I offer to people who are resigning. 1) Provide your employer with two weeks notice if you intend to resign. Even if you are still working during the 3-month probationary period, you should still give them notice. They may want to hire someone to take your place and will expect that you'll be around to train them. Plus, if they decide they don't want to you to work for them anymore, you've still done everything right. 3) Be nice to everyone. I've always said that once you resign, you really get to see the true character of the people you work with. Often, people will let their personalities out because they don't need to impress you anymore once you are on your way out the door. 4) On your last day, write a thank you note/card to your supervisor. Even if they've treated you horribly, you can thank them for one thing - making you realize that you deserve to be treated better. Don't say that in the card, but writing a nice card thanking them for hiring and training you goes a long way. And you leave knowing you acted like the more mature person! 5) Make sure you get contact information from anybody that maybe able to help you later on. For example, if you and your manager are leaving on good terms, get his or her phone number and e-mail address should you need to use them as a reference. I'd even go a step further and get that information from colleagues, as they can also provide references in cases where your direct supervisor cannot/will not. As I said before, resigning is never easy - trust me! But it doesn't have to be uncomfortable. And the reality is that resigning a job is a common practice and it will only get more common as jobs become less and less stable. The key is to leave in such a way that no bridges are burned - that doesn't necessarily mean that you'll be re-hired, but you never know if you'll run into these same people again. In fact, think of it this way. Resigning is a lot like leaving the stage after you've just given a monologue. The key is to end well, keep your head up, and maintain your integrity. By doing that, you'll side-step any obstacles that come your way. And that's how you exit stage left gracefully!